Capcom's got a ton of fighting titles in the works, but neither Darkstalkers nor Capcom vs. SNK are getting a new game anytime soon. It's been a while since the Darkstalkers and Capcom vs. SNK franchises received new titles, much to the disappointment of these series' fans. These fans should be relieved to know that Capcom hasn't abandoned either series, but it's going to be quite a while before fans get to play a new game. According to Christian Svensson, Capcom's US VP, in a forum post, the games are on the company's mind, but they're not an immediate priority. "Right now we're focused on Street Fighter X Tekken, SSFIV: 3D Edition, Street Fighter 3 Third Strike Online Edition, Marvel vs. Capcom 3 and maybe something else somewhere ... That's more than enough fighting products for an audience to digest in the near term without overly cannibalising each other ... It takes years to make a game (that's multiple years), even an HD Remix, so while we may get to them some day, that day is still likely to be a ways off." Of course, back in September, Street Fighter producer Yoshinori Ono admitted that making a new Darkstalkers game was his "ultimate dream," but it wouldn't happen without fans making a lot of noise about it. 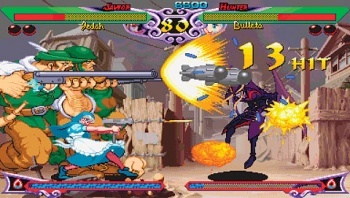 The last official Darkstalkers game was Darkstalkers Chronicle for the PSP, though at least two characters (Felicia and Morrigan) are scheduled to appear in Marvel Vs. Capcom 3.